Home Idle Ramblings The passport has arrived! After a bit of a battle with our 4 year old son (he was 3 when we began the battle) to get a photo to make an application to replace his expired passport we finally succeeded. 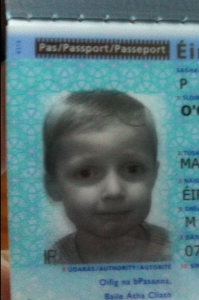 I don’t know what happened – maybe he matured in the weeks and months from our first (disastrous) attempt at getting him to sit for a passport photo. With flights booked (albeit in August) I started to think the worst, that we would still not have succeeded in getting our little man to get a photo and the passport office would be in the thick of their silly season for passports that we would have to cancel all our foreign holiday plans. So I was very relieved to have finally got the shot! I didn’t hesitate, within 48 hours of getting the shot the application form was signed off by the Gardai and the application was winging its way to the passport office via the Passport Express service – I was taking no chances on the normal application process and I have always found for the extra few euro having the passport back in 10 working days has worked a treat and alleviated much stress and unnecessary worry – except when my daughters passport was in the passport office and they went on strike and I had a holiday booked but that is (hopefully!) a once off and never to be repeated! Sitting in the post on my return from work last Thursday was the new passport! Previous articleWhen mammy gets sick! Next articleLet the countdown begin!